‘Gardens with different levels are always more interesting than flat ones’, I reminded myself, staring down at a new garden that would be more suitable as a ski slope than an British garden. But mostly we don’t have any option other than make the best of what we have; and what we have seems to be coming along in more unusual packages as housing gets crow barred into more marginal areas of land. Slopes! How do you deal with them? Well the steeper they are the more you have to concentrate your resources regardless of whether they slope away or towards the house. Decide where the main sitting area is going to be,for entertaining,catching the evening sun, kids play area, BBQ, whatever you use it for try to create as large a single level space as you can. A single garden divided into 5 narrow terraces for instance is actually 5 small gardens because you can’t use them all at the same time. Building retaining walls or raised decks can be expensive if your not careful but so is wasting half the ground your sitting on if you can’t get more than a couple of steps out of the back door. Some uneven gardens could be managed with sloping paths but mostly steps are needed. Whether in brick, timber or stone it pays to make them generous so they become part of the design rather than a functional means to an end. How steep they are will depend on the topography of the garden. Steps are measured in the ‘going’ and the ‘rising’. The first is the depth of the step front to back, the second is the rise in height. The more ‘going’ and the least ‘rising’ the more comfortable the step but work on something around 150mm,(6″) as a comfortable riser if you can get away with it. Get it the other way around and you can feel like your climbing a ladder. The tread of the step needs to be as safe and non slip as possible, a textured or riven slab, chunky timber edge backed by gravel, deck steps can incorporate ‘grip strips’,brick on edge etc. the worse steps I ever came across were made of slate, one shower of rain and they were lethal, they had to go! 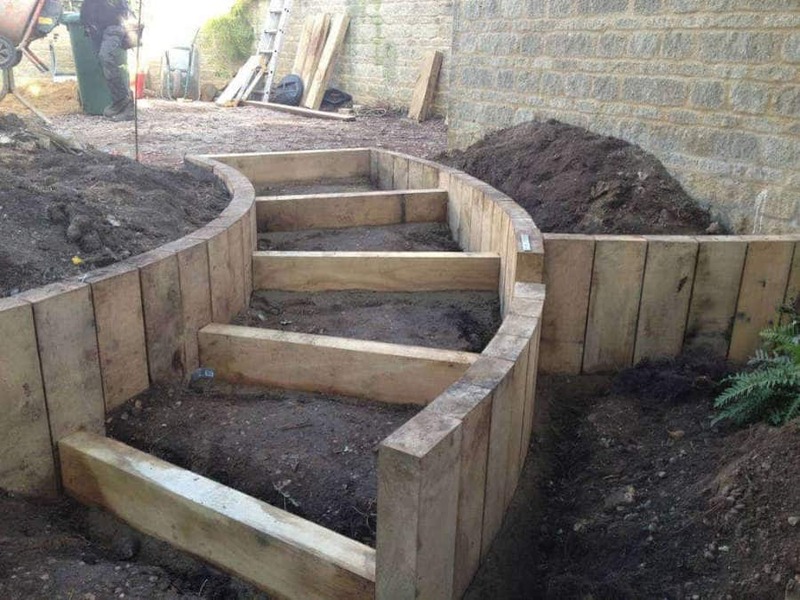 You may need walling at the sides to retain soil, you pretty much need to build this first then fit the steps between, the opposite is also true if raised up make sure a handrail is installed. Essential as a handrail is it’s difficult to make it easy on the eye, the simpler the better as fussy detail can be distracting. Presumably we want everyone looking at the garden and not the safety features. In bigger gardens Break the steps up with landings if you have a way to go or even change direction if you have a long way to go! It makes you look at different views of the garden or house that normally you wouldn’t see. 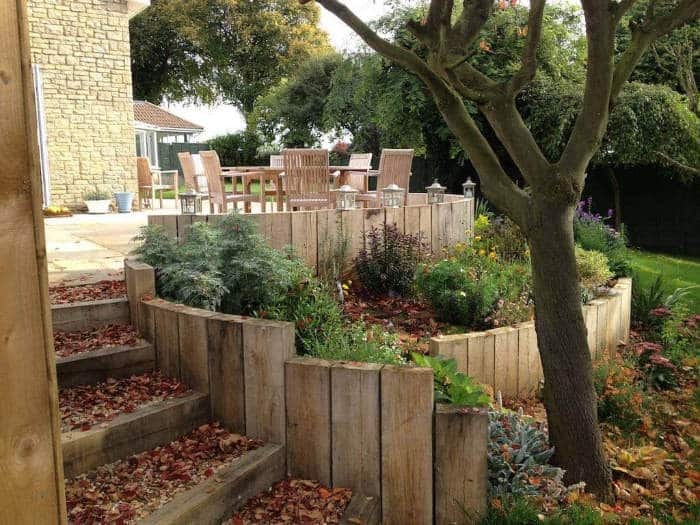 To stop the hard landscaping dominating too much it’s important to soften walls and edges and even steps with planting, all the elements of the design should work as a whole and the planting will be key to this.